Lionfish: Island School’s favorite dish! The invasion of lionfish on reefs of the West Atlantic has become an issue of critical concern. With eradication not possible, the silver lining is that lionfish are delicious. The You Slay, We Pay campaign was launched by Dr. Jocelyn Curtis-Quick to support the development of a local lionfish market in The Bahamas. 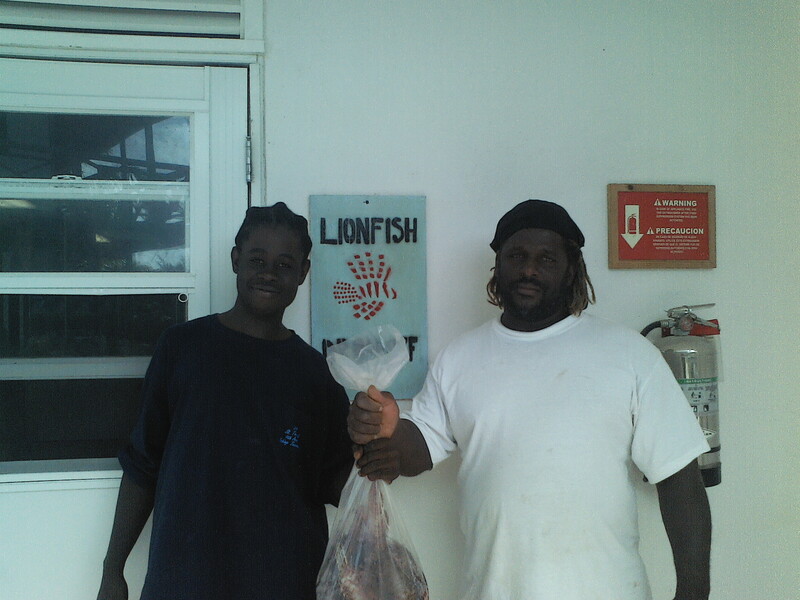 The Island School bought lionfish from local Bahamian fishers to consume in the dinning hall. The slayer campaign initially ran through lobster closed season in 2014, as this is the time of year that many fishers will switch to conch harvesting, which is less lucrative as a fishery and increases pressure on the already overfished species. This trial lionfish season was so successful that in December of 2014 (during the closed grouper season) the lionfish You Slay, We Pay was launched all year round. Over 1500 lbs of lionfish were brought in throughout 2015, with new fishers joining regularly and more lionfish meals being enjoyed on campus. We hope that 2016 sees even more lionfish removed from the reefs and on the plate. 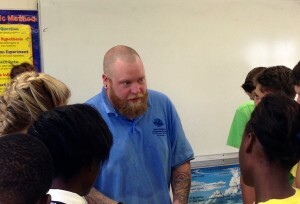 The Sea Turtle Research team held an in-reach for local staff on Tuesday, December 1. 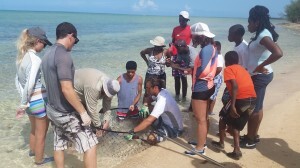 Local staff members who had never gone “turtling” before, and many who had never seen a sea turtle, were given an opportunity to visit one of the research team’s study sites, Starved Creek, in order to catch turtles. 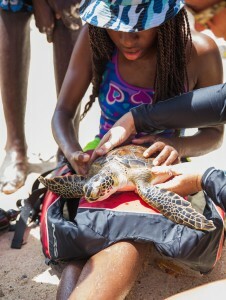 The aim was to have everyone at least see a green sea turtle in its natural habitat. 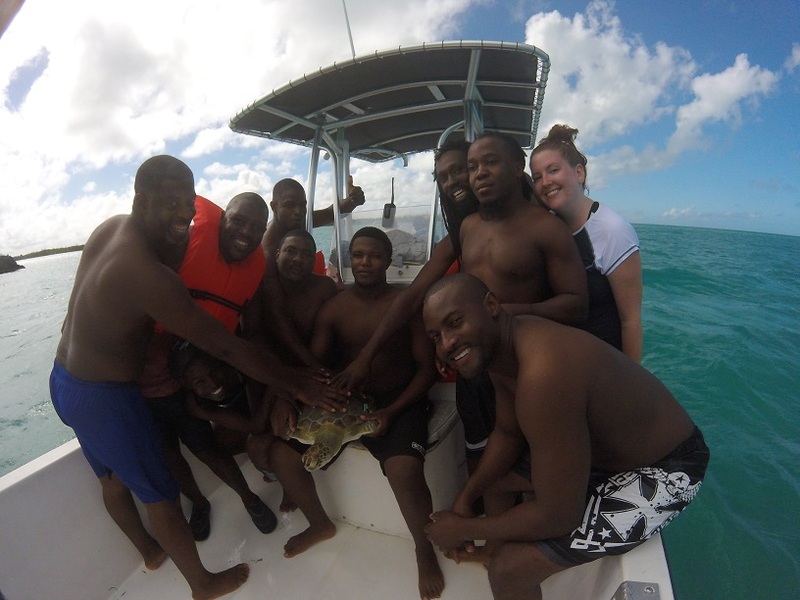 Facilities team holding the turtle of the day! The second group that came out in the afternoon consisted of the Accounting Team. Although this group came mere inches from catching a turtle, they were not able to do so. Yes, sea turtles are indeed very efficient swimmers! Chasing this turtle, however, had the boat filled with a mixture of elated, excited, enthusiastic, and adrenaline-pumped individuals who, put simply, were revelling in the experience. Final Earthwatch team of 2015! 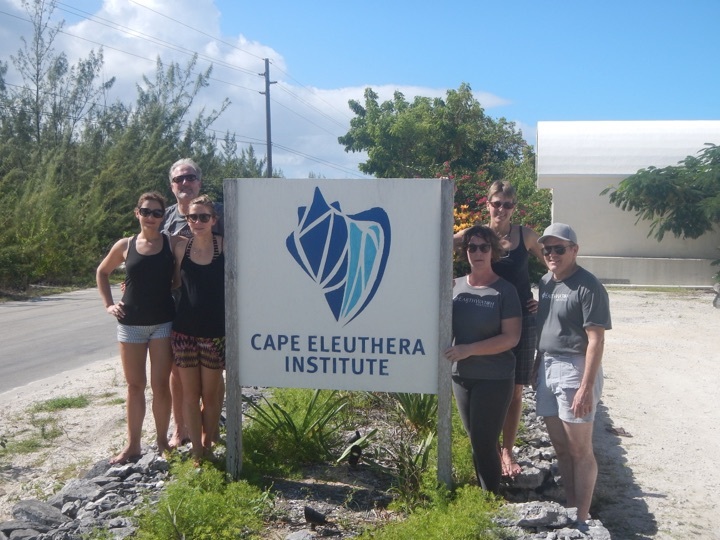 The Cape Eleuthera Institute Sea Turtle Research and Conservation team finished off an awesome year of Earthwatch trips with the 8th and final Earthwatch team of 2015. Participants from the US, the UK, and Canada joined the expedition for 9 days of exciting research. 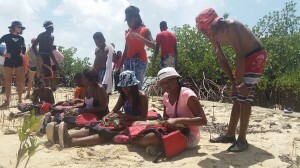 The participants were enthusiastic to get involved in the many facets of sea turtle research happening at CEI. 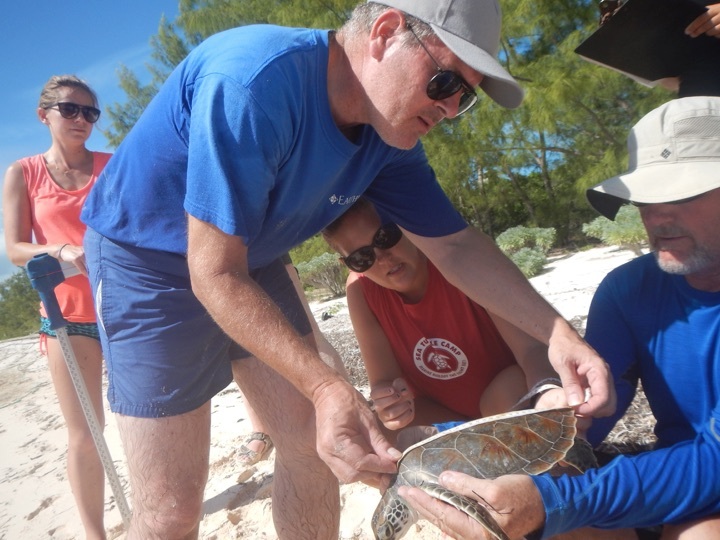 The volunteers got hands on experience setting baited remote underwater video surveys (BRUVS), doing abundance surveys at various locations, as well as catching plenty of turtles! The Earthwatch team also got the chance to hear from other researchers at CEI about projects going on during nighttime presentations. These presentations varied from sustainable fisheries management to coral reef health and ecology. A substantial amount of data was collected over the week, with 259 turtles spotted during abundance surveys across the creeks of South Eleuthera. We also had two record-breaking days in a row during abundance surveys, with exactly 127 turtles spotted, on both days, in Half Sound! 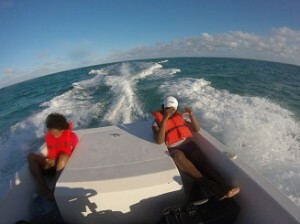 Last week, the Stingray Research Group, headed by Dr. Owen O’Shea, took 15 of our Bahamian staff members out to The Schooner Cays– a location the majority of staff have never visited despite gracing the views from office windows all over campus. The goal was for the team to experience and learn the scientific objectives of this research project Two groups of staff were organised into morning and afternoon trips, along with other ray team members. First, there was safety briefings and capture methodologies discussed in the boathouse, along with the objectives and conservation ambitions of this research, before heading out on the water to find rays. 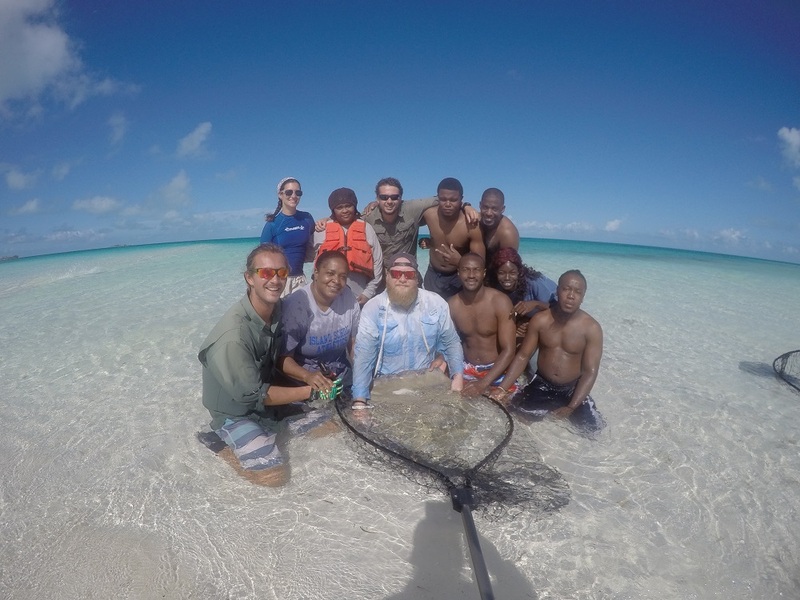 The morning group, featuring kitchen manager Sophia Louis, guest services employee Corey Lightborne, and Bio-diesel engineer Sammy Dorcent, saw five stingrays caught in just 3 hours, including three new individuals, and the retrieval of one of our data loggers. The team was enthused and excited to be part of this research, and preconceptions regarding these gentle animals were challenged, with every member participating in either catching or working up animals. The afternoon session saw a slightly tighter schedule (largely due to inclement weather), and included head of facilities Oscar Knowles, most of the accounts team, and campus mechanic Valentino Hall, who helped catch two additional rays. We were also able to deploy a data logger and, like the morning team, we travelled back to Cape Eleuthera to the sound of joyous discussion on how valuable the experience was. Requests for further expeditions have been made, and certainly the Stingray Research Group aims to make another trip before Christmas, for those staff unable to attend this one. Stingrays are among a group of animals poorly understood and often feared among Bahamians, and so sharing this work and allowing up close and personal interactions with these rays has dispelled myths and changed perceptions, certainly among those staff who attended. 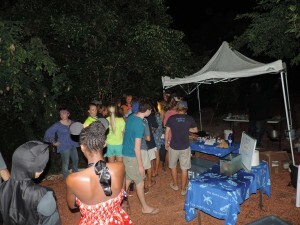 On the night of Halloween, the CEI team put on their lionfish costumes and travelled to the Spooktacular event at the Leon Levy Native Plant Reserve in Governor’s Harbour. 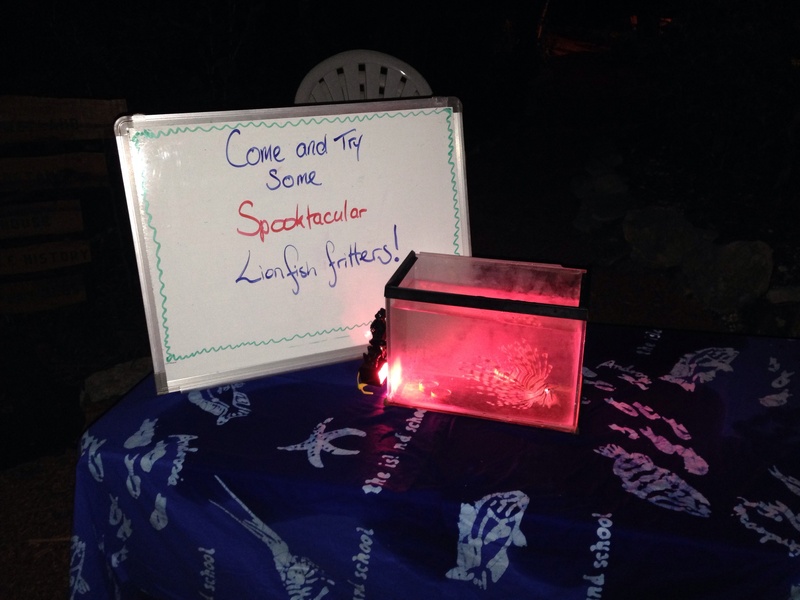 The team continued to spread the word about the lionfish invasion with spooky red lights illuminating a tank showcasing a live lionfish, and dyed blue, green and red fritters. 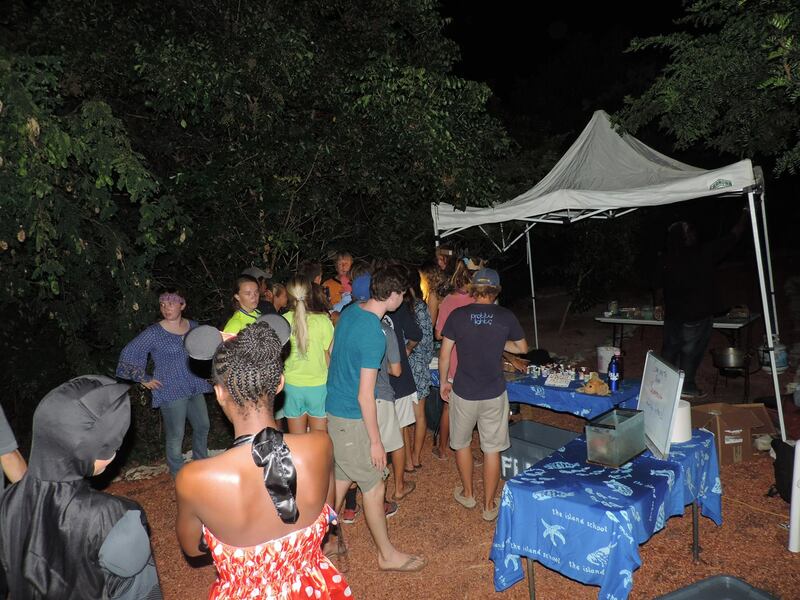 Batman, Spiderman, witches and several zombies came to view the illuminated invasive lionfish, and were served the spooky and tasty lionfish fritters. Those who had never tasted lionfish before enjoyed the delicious fish and gave great feedback, stating they were tastier than conch fritters, even when they were green inside! 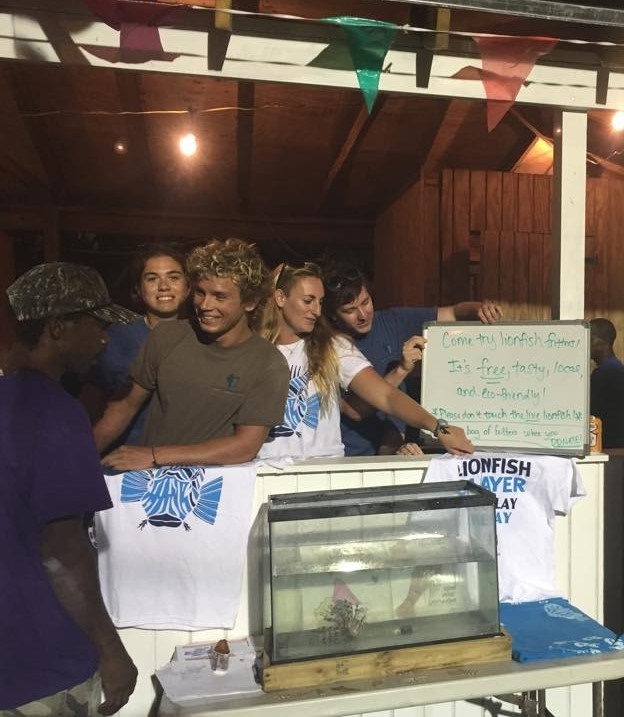 Next weekend the team will be setting up a booth at the Governor’s Harbour Homecoming, and hope to continue our long term goal of seeing lionfish not just at outreach events, but permanently on restaurant menus throughout The Bahamas. 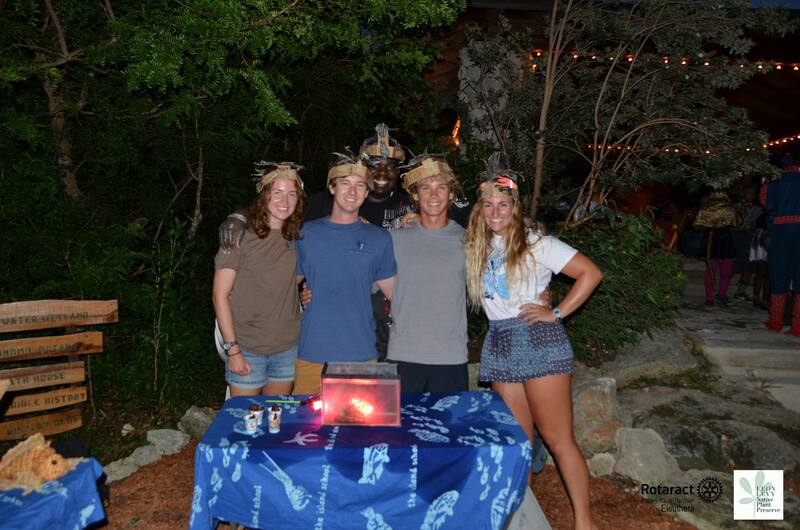 The lionfish team, ready to spook! 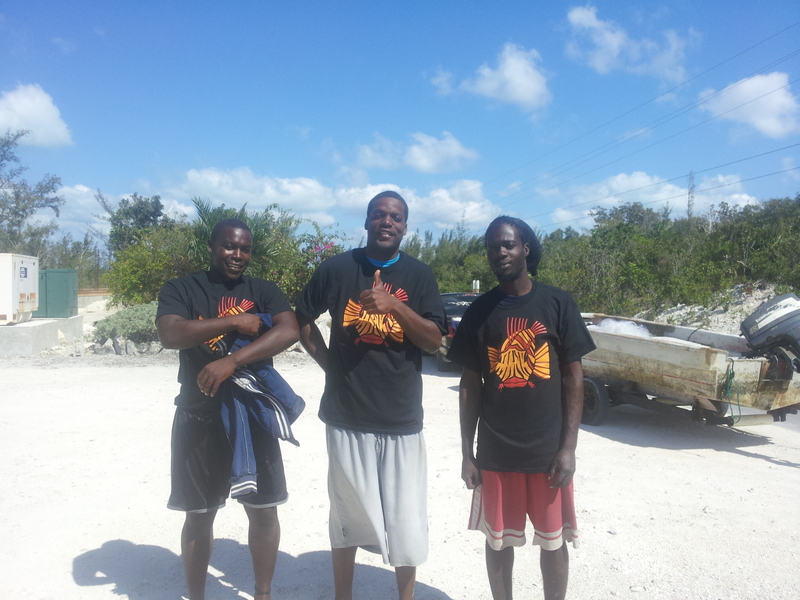 On October 10, the CEI team headed to Wemyss Bight Homecoming to spread the word about the lionfish invasion. 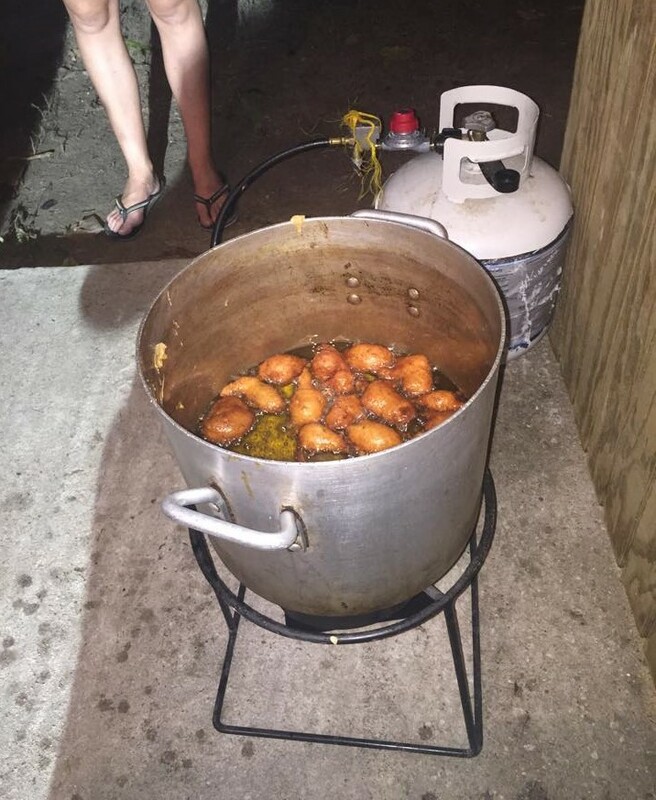 The team was armed with a large batch of lionfish fritters to give everyone the chance to taste these invaders. The booth grabbed lots of attention from a large range of age groups, enticed by the live lionfish in a tank and the smell from the fritters! Most people had the perception that lionfish were poisonous and wanted to know if it was safe to try the fritters. The misconception that lionfish are poisonous is a large problem facing the management of the invasion, as it reduces the demand for lionfish! After educating people that lionfish were in fact venomous (therefore the meat contained no toxins) and extremely tasty, the fritters were a hit! Earrings made from lionfish fins were also on show, enabling us to increase awareness surrounding the lionfish jewellery market, another great way to increase incentive for the removal of the invaders from reefs. The team will be continuing to attend events like these in the future, passing on knowledge and changing people’s opinions on lionfish. CEI visits Students of Spanish Wells to talk rays and sharks! On Friday 18th September, Dr. Owen O’Shea of the Shark Research and Conservation Program along with Shark Program intern Amanda Billotti and Educational Program leaders, Anna Zuke and Lydia Geschiere made the trip to Spanish Wells’ All Ages School to deliver a workshop to 36 students from 11th and 12th grade as well as their teachers. 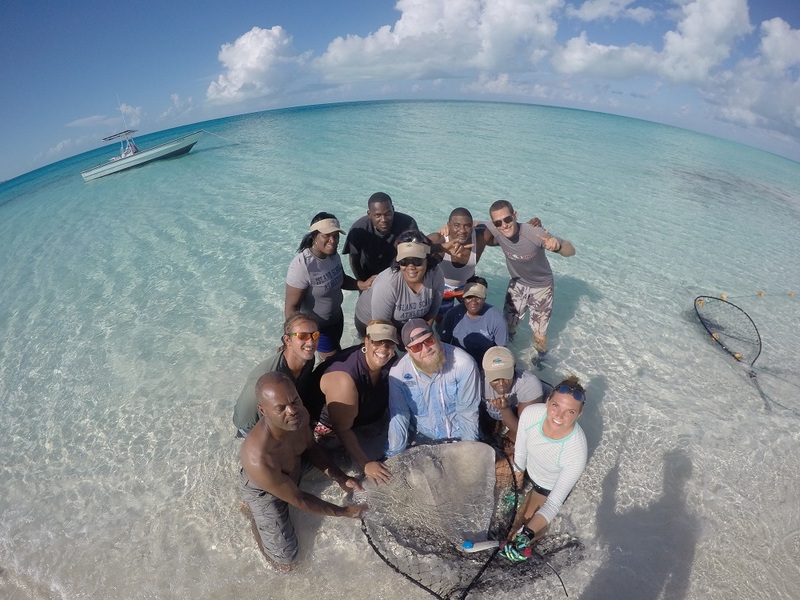 This was the first time that CEI scientists have visited this tiny fishing community off the north coast of Eleuthera to share the exciting work we do here. During the workshop students were given presentations about the evolution ecology and importance of rays and sharks, particularly in Bahamian waters lead by both Dr. Owen O’Shea and Amanda Billotti. One of the main themes touched upon was the importance of these ancient animals as economic resources in The Bahamas; discussing how a living shark or ray is of greater value as a tourism tool, then a dead one at market. The students then participated in group discussions where they were able to collaborate amongst themselves to demonstrate and share what they had learned. Four key concepts were randomly assigned to each of four groups, and the CEI team mentored a group each, before a student from each team presented their groups responses to the class – these topics included discussing the ecological role of these animals in marine ecosystems and global challenges to the conservation of these animals. CEI research teams in collaboration with the Educational Program team are striving to increase outreach to other communities on Eleuthera. 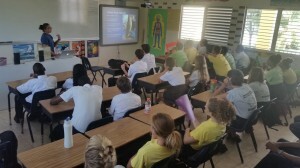 Each month will see representatives of the Shark Research and Conservation Program travel to a different school to deliver interactive workshops and discussion with students about these most valuable of marine resources. CEI and team EP aims to continue to promote internship opportunities to Bahamian students, and this was warmly received by all of the students we interacted with last week. 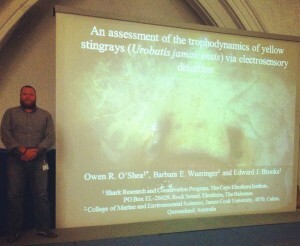 Dr. Owen O’Shea presents his research on electrosensory prey discrimination in a local species of round ray – Urobatis jamaicencis. 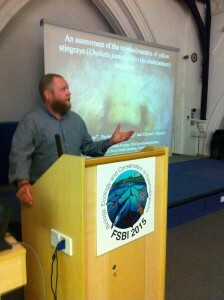 Plymouth University and the historical Marine Biological Association of the United Kingdom hosted the 2015 Fisheries Society of the British Isles annual conference. This year’s symposium theme was the biology, ecology and conservation of Elasmobranchs (sharks and rays). Dr. Owen O’Shea represented the Cape Eleuthera Institute and The Island School by presenting his work on electrosensory prey discrimination in a local species of round ray – Urobatis jamaicencis. This research was taught during applied scientific research class at The Island School in Spring 2014 and was warmly received by 178 leading shark researchers from across the globe. The plenary speeches were led by a range of well-respected and established scientists such as Greg Cailliet who spoke of advances in the ageing and growth of elasmobranchs, Sonja Fordham who is founder and president of Shark Advocates International spoke of the recent CITES listings and conservations challenges in the political arena and Greg Skomal discussed his work tagging great white sharks. This work has contributed to the paucity of knowledge surrounding the efficiency at which rays search for food, considering their prey are often concealed beneath the sandy patches amongst reef habitat in which we find them. From this information, we can better understand how these animals are able to forage effectively in term of their energy budgets. This is important because yellow rays compete with other similar fishes for the bounty that lies beneath the sediments, and so maximizing foraging efficiency is critical not to get left behind! The conference offered an eclectic blend of talks ranging from remote camera systems following great white sharks, to the politics surrounding shark and ray conservations and the challenges faced in protecting many species. It was an honor to be a part of this conference and to not only share the work we do here at CEI, but to learn from our peers about their work, and hopefully forge future relationships and collaborations. BREEF 2015 Summer Camp at CEI! 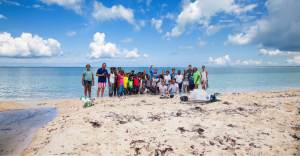 On Friday, August 21st, the Shark Research and Conservation Program at the Cape Eleuthera Institute was once again honored to host and be involved with 22 young Bahamian students from the Bahamas Reef Environment Educational Foundation (BREEF) Eleuthera Sea Camp for a full day of research-related activities. Friday capped off a week-long summer camp focused on the Eleuthera’s marine environment, and the relationships that residents of the Bahamas have with that environment. Firstly, students were introduced to our systems and facilities via a 60-minute walking tour of campus including a visit to our permaculture farm, aquaponics system, wet lab, and biodiesel facility. At each stop, members of the community informed students about sustainable farming practices, biodiesel production, and how we grow fish to not only eat, but that help us grow our lettuce and herbs. Following the campus tour, the students ate a picnic lunch at the Boathouse with members of the Shark Team. 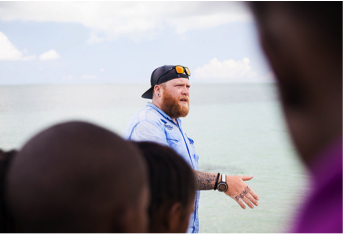 Dr. Owen O’Shea describes the importance of understanding how stingray biology influences the environment around the Bahamas. The afternoon was full-on, filled with the CEI shark research team, shark handling demonstrations, and a stingray tagging experience. Research Technician Cameron Raguse kicked things off with a short presentation on shark ecology, explaining their role as a top-predator in the Bahamas and how integral they are to maintaining a stable ecosystem. 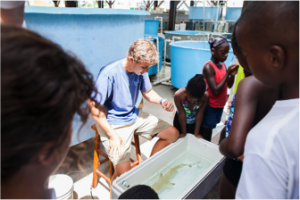 The students then split into groups alternating between two activities: one with Dr. Owen O’Shea and his team for stingray tagging; and one with University of Illinois graduate student, Ian Bouyoucos demonstrating shark handling and physiology. In each case, the students got an in-depth look at research here at CEI, as well as getting up-close with some often misunderstood animals. Ian Bouyoucos, M.Sc candidate at the University of Illinois, prepares to show the students a juvenile lemon shark. 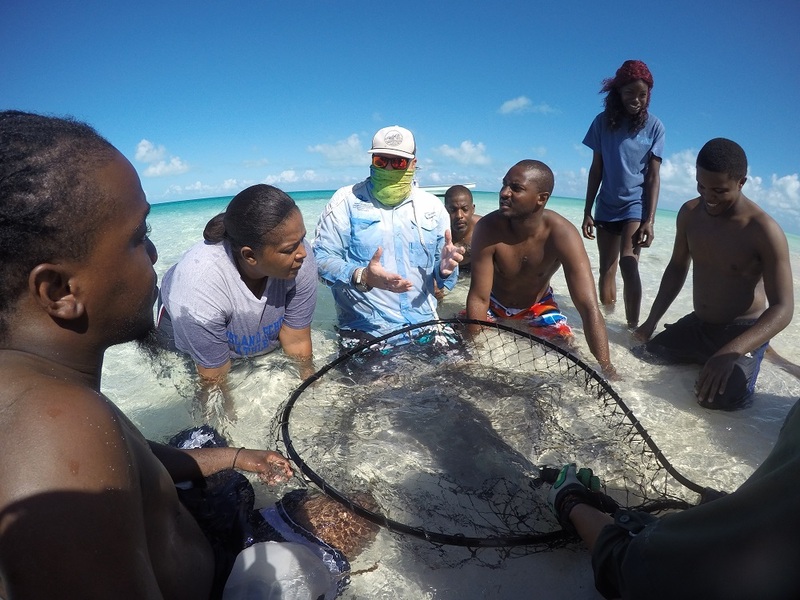 At the end of the day, the group left with a better understanding of elasmobranchs as a whole, and a deeper appreciation for the wildlife right at their doorstep. To check out photos from the camp, go to our Flickr album!